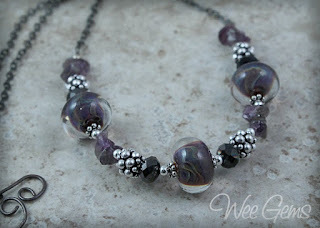 Wee Gems Designs: 5th Bead Soup Blog Party! 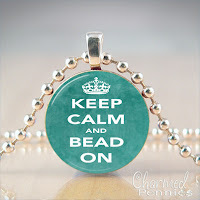 5th Bead Soup Blog Party! Today is the day! 200 of us jewelry designers have traded bead soups with partners from all over the world, and today we are posting the creations we designed with the soups we received. My partner this time is Jennifer Justman of Souls Fire Designs. Here is what I created out of the fabulous goodies Jennifer sent. I took one of my Lampwork focals, paired it with some PMC bead caps I had made with the tiny bead caps Jennifer sent. I then put it on some gunmetal chain and the beautiful silk ribbon she sent. I love this necklace! Here is where you can see what Jennifer did with the soup I sent her. Also be sure to check out all of the other participant, it is sure to be fun and have you wanting to run to your studio and create! I also want to do a give-away as well. After all every good party has a favor! So there you have it, five different ways to enter:) Leave me a comment letting me know how you entered. **I will announce the winner in a month on March 31st, giving us all plenty of time to visit all of these fabulous blogs. ** Please check back to see if you have won or with a way to contact you if you win!. 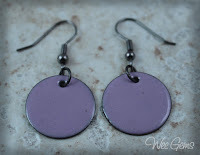 Here is what you are playing for: a pair of purple enameled earrings and a Charmed Penny! I love the ribbon necklace and the one with the chips, I really like how the chain compliments them both. That heart clasp is very cute too. Gorgeous pieces! Looks great Kari. Love the simple one and the ribbon one a lot. And the other one too. AUGH, too cool all over. Your beads paired great wtih her soup. Wonderful designs. 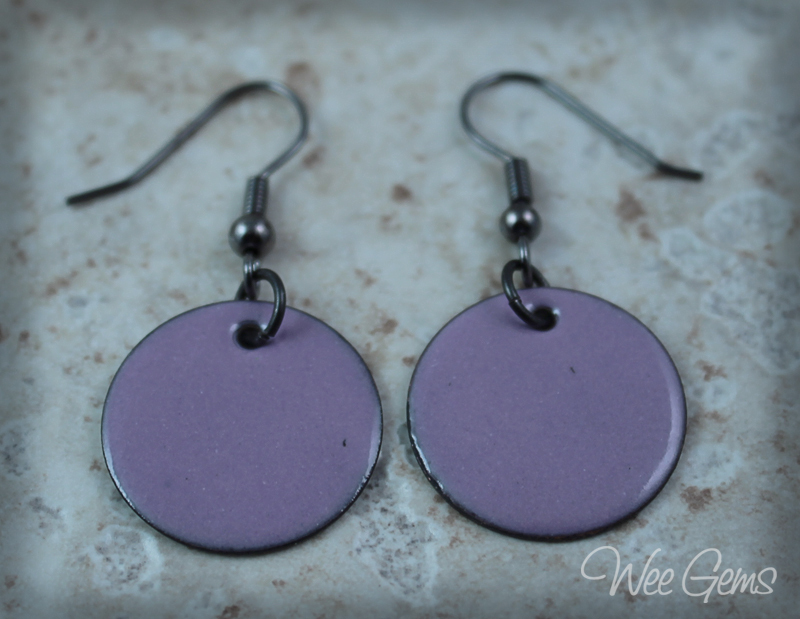 I am enjoying the gunmetal and purple combination. 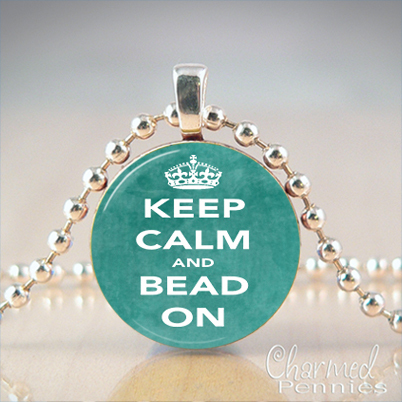 I have too many "favorite" bead splurges! 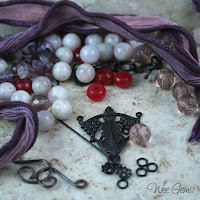 What a fun soup to play with - love the first necklace, too!! I'm already a follower! I adore all the necklaces! Purple is my favorite color, so I am very drawn to those. But even though I don't wear red, that necklace is to die for! Love the simplicity and the red just pops. Beautiful! Yay, Kari! I love it all!!!! I wanted to be the first comment-er but woke up with a tummy ache and slept in lol. These are all so incredibly beautiful!!!! I am totally amazed by what you did with the soup I sent! ((HUGS)) Thank you thank you for being such an amazing partner! Beautiful pieces!! A nee blog for me but I will definitely return!! 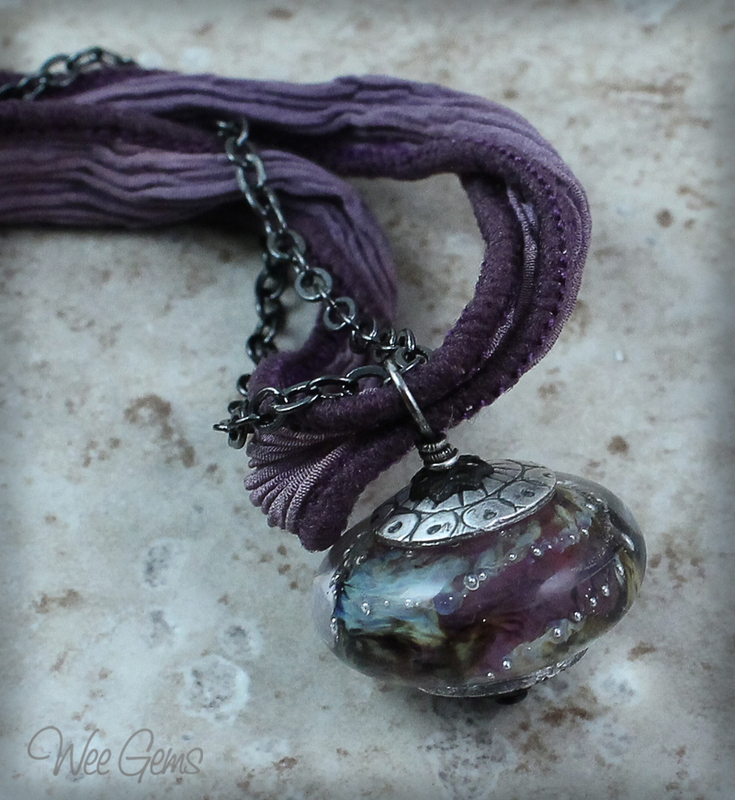 Oh, I adore the silk with your lampwork bead! Stunning combo. I would be wearing the red necklace a lot as well. So glad you had fun making your pieces. Really lovely pieces. Pretty, clean and distinctive. Great colors! I LOVE those first two necklaces! 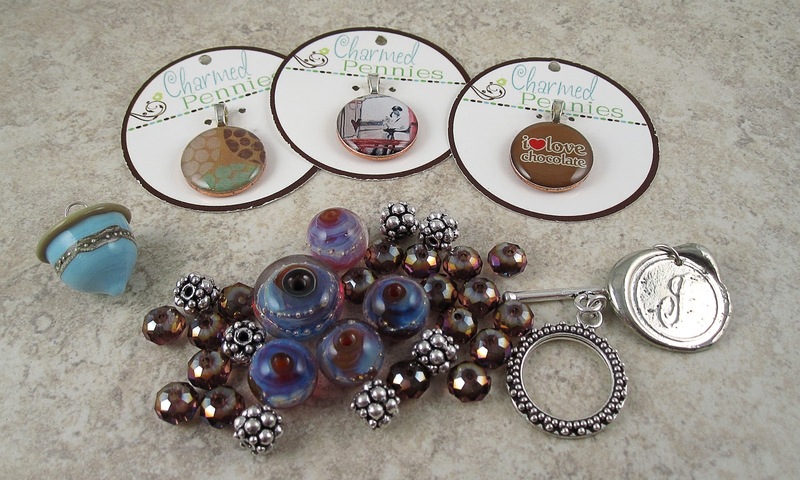 The lampwork beads are great! super fun pieces. I am sure glad we don't have to pick a favorite at each stop, I would be stuck on here for weeks!! Everything is so dark and romantic. Lovely! I think that keeping that last necklace simple was exactly the right thing to do! Your other pieces are lovely as well! I love how you doubled up on the bead caps - that is a very cool effect! Your creations are beautiful! The first necklace is really a stunner! Boy do I wish my PMC bead caps turn out as beautiful as yours do! So pretty! You should always listen to your beads, lol, that red necklace is too cute! From one mother of 4 to another! Way to rock the soup! They are elegant and well balanced. Lovely designs! Oh that eggplant purple color made me drool. exquisite designs. 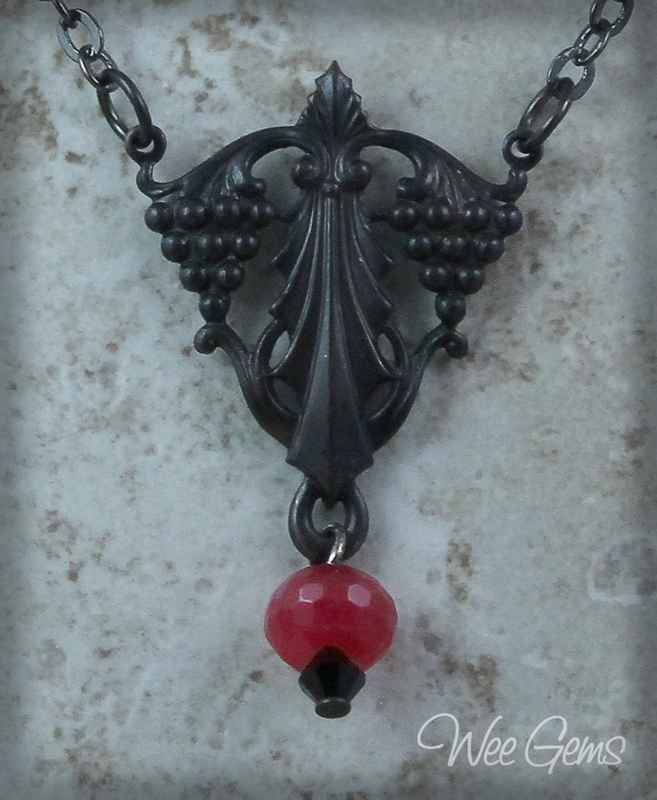 I think I like the simple chain in black and red the best. I love brass stampings! Such glorious shades of purple in that first necklace. It's sensual! I love the purple/grey combination it is very lovely. Lovely designs. I like the fist both necklaces very much - they are very elegant! And I admire the lampwork-beads you've made for the designs! I really like all three of your necklaces! I wouldn't be able to pick a favorite. Really nice work!! Your lampwork beads are just beautiful. The ones you picked matched your bead soup ingredients perfectly. I love the romantic feel of your pieces. What an interesting clasp, you did a wonderful job with your soup ingredients. Cheers! What a beautiful bead soup you received! I love all the pieces you made, but my favorite is the last necklace. I like that you knew when to stop--and the result is a very elegant piece. Oh yes, my favorite bead splurge, well that would have to be the long, gorgeous strand of ancient Carnelian Trade Beads that I picked up at the Lost City bead shop while visiting San Diego. I've used a few beads here and there, but I'm having trouble letting go of them. Love them all! Love the purple! I enjoyed reading your post and love the necklaces you made with your soup. I really likes the lampwork focal on the ribbon but the last one with the red dangles is gorgeous too. It has a rather victorian flair to it. Would be tickled to win your earrings. I have become a follower on your blog. 3. Looked at your Wee Gems Designs facebook page and "liked". 4. Looked at your Charmed Pennies facebook page and "liked". I will call myself Mary. I purchased a strand of turquoise in Colorado when we were on vacation. It was very expensive and I lied - outright lied - to my husband about what I paid for it. And the bottom line is he really wouldn't even have cared at all, but I guess it was guilt rearing its ugly head. Mary, that is okay. Your secret is safe with us. Mary just told me that she feels much better now that that is off her chest. Now do you want to hear about the gaspeite that Mary bought on the same trip? No, I thought not. I was so tickled with jean's post I forgot what I was going to say lol Love the last necklace and that pop of color you gave it! And I really like thee purple too - I think you really really really really need to pick Jean! Have a great day - sorry I straggled in so late! Your pieces are great. 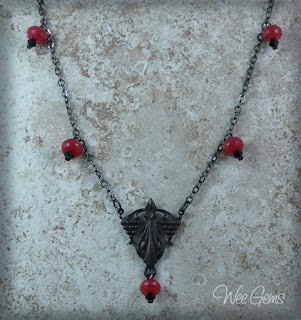 I love the simplicity of the red necklace. And your beads with the amethyst chips in the other piece are so pretty. I tweeted about your BSBP post. Gorgeous jewellery! My fave's the first necklace. Love the colours and design. Fab job! These are beautiful pieces, Kari, you did a wonderful job! Gorgeous necklaces! You've been able to show off your talent and those that you've been sent. Your lampwork matches everything she sent so beautifully. 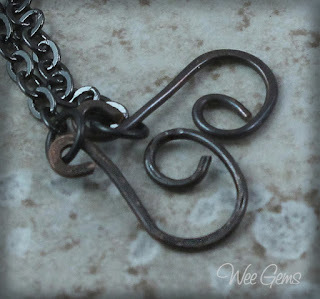 I love your first necklace and agree that the simple design in the second is just great! Two gorgeous necklaces! I'd wear the second one all the time. Sorry I am so late to the party - still working my way through the Bead Soup! Love your creations - I agree, the simple design for the red and gunmetal necklace worked real well. All three of your necklaces are so . . .wearable. I know that isn't some fantastic comment, but they're all three pieces I can see just about anyone wearing. I especially like the first one with your lampwork bead, stunning! You really did a great job on this challenge! Congrats Wendy! You won my drawing! Thanks for sharing. Keep posting like this.